Leukonychia – a.k.a. ‘white spots on fingernails’ or ‘white nails’! Leukonychia is a medical term for white discoloration appearing on nails. The word ‘leukonychia‘ is derived from the Greek words ‘Leuko’ (white) and ‘Onyx’ (nail). 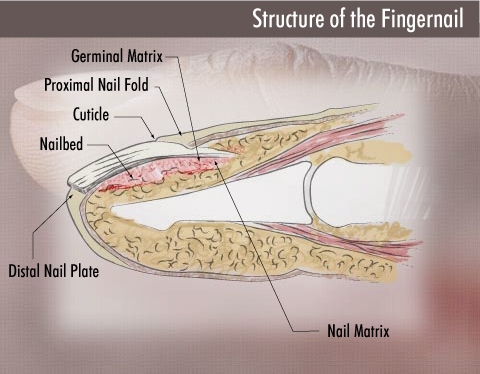 The most common cause is an injury to the nail root (matrix) where the nail is formed – due to for example: excessive ‘nail tapping’ or slamming in a car door. • transverse leukonychia (‘leukonychia striata’): discoloration of the nail in bands or ‘stria’ (also seen in cirrhosis and chemotherapy). One must also be aware that ‘leukonychia’ in the hands of children (usually not caused by a medical problem). • What is ‘fingernail pitting’?